Before defining optic nerve atrophy, it’s important to define the optic nerve. The optic nerve (or cranial nerve II) is a paired nerve responsible for transmitting visual information to the brain from the retina (the part of the eye responsible for carrying vision cells). The optic nerve is the circular/oval pinkish area located in the middle of the retina measuring 1.5-2 mm in diameter. The nerve carries many other nerves connecting the retina to the occipital lobe (the region in the brain responsible for interpreting vision). Optic nerve atrophy (ONA) is a condition used to refer to mild or severe damage of the optic nerve which affects; color vision, peripheral vision, and central vision. Optic nerve atrophy which affects children may cause nystagmus or rhythmic, involuntary eye movement. 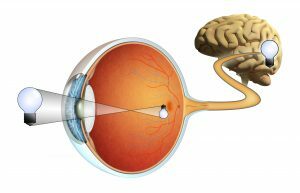 Let´s take a look at causes, symptoms and optic nerve atrophy treatment options available. There are many causes of ONA which range from trauma, tumor, decreased blood or oxygen supply to hereditary causes, toxins, infection, hydrocephalus as well as rare degenerative disorders. ONA usually affects individuals from birth throughout adulthood with the most common causes revolving around eye trauma/injury. Eye diseases/conditions have also been linked to many cases of optic nerve atrophy. Optic neuritis is an eye condition that causes inflammation of the optic nerve as a result of autoimmune conditions, bacterial, fungal and viral infections, toxins, parasitic diseases, allergies, diabetes, digestive problems as well as poor circulation. Individuals suffering from optic neuritis have a high chance of suffering from optic nerve atrophy. The inflammation affects the myelin covering causing the optic nerve to get swollen and damaged over time. Optic neuritis is usually accompanied by severe eye pain when the eyes move normally. The condition is common among young and middle-aged women. As the name suggests, Leber’s hereditary optic neuropathy is a congenital eye disease. The disease causes fast, painless and severe central visual loss in young men mostly in their late teens or early 20s. The vision loss usually affects one eye over a week and then progresses to the other eye weeks or months later. The disease usually results in permanent optic nerve damage which in turn results in permanent vision loss. Toxic optic neuropathy is triggered by toxins and poisons such as tobacco-alcohol amblyopia as well as exposure to cyanide (from tobacco smoking) and deficiencies like low vitamin B12 levels. Other toxins known to cause toxic optic neuropathy include; methyl alcohol, led, carbon monoxide and ethylene glycol. Some medication is also linked to toxic optic neuropathy. Toxic optic neuropathy disease damages the optic nerve gradually or suddenly resulting in vision loss. This type of optic nerve damage is caused by protein, folic acid, vitamin B12 and B vitamins deficiencies which are caused by starvation, poor nutrition, poor absorption as well as alcoholism. Treatment of nutritional optic neuropathy involves supplementation to reverse the deficiencies. Glaucoma is an eye disease characterized by fluid buildup in the eye (on the front part) causing pressure which damages the optic nerve. If left untreated, Glaucoma causes permanent optic nerve damage and blindness. Tumors or lesions cause optic nerve damage by enlarging the muscles and areas associated with eye movements which in turn exert a lot of pressure on the optic nerve. Compressive optic neuropathy is a popular cause of optic nerve atrophy arising from tumors. • Poor visual function such as; decreased peripheral vision or decreased sharpness/clarity of vision. Conventional optic nerve atrophy treatment for addressing optic nerve problems focus primarily on limiting further damage. The treatments may involve; reduction of fluid pressure around the spinal cord and brain or prescribing spectacles to address refractive errors. Tinted lenses or magnifiers may also be prescribed to improve visual function. Stem cell therapy can be used to reverse optic nerve damage treating diseases like optic nerve atrophy. The therapy involves administering of stem cells into the retrobulbar space to repair damaged tissues. Stem cells such as MSCs (mesenchymal stem cells) can differentiate into photoreceptors among other cells treating lesions in the retinal pigment cells and optic nerves. Optic nerve atrophy stem cell therapy can result in improvements in the visual field, night vision, light sensitivity, visual acuity, nystagmus, and strabismus. Stem cell therapy can slow down/stop further vision loss among individuals with progressive conditions. 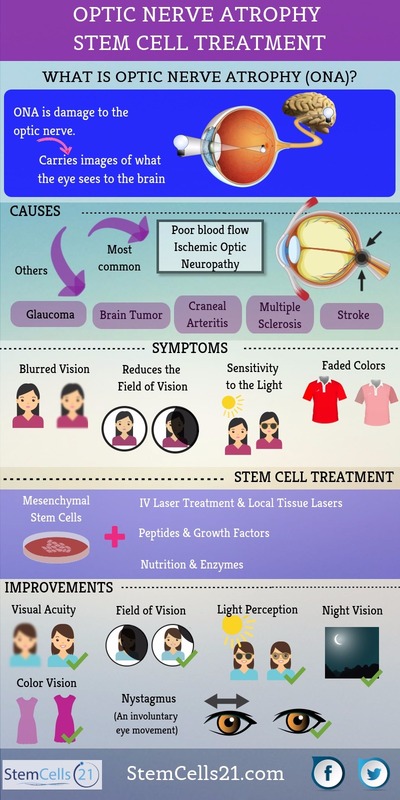 In a nutshell, stem cell therapy can improve eyesight, color discrimination capacity and field of vision in patients with optic nerve injuries or optic nerve atrophy (ONA). Would you like Treatment for Optic Nerve Atrophy?